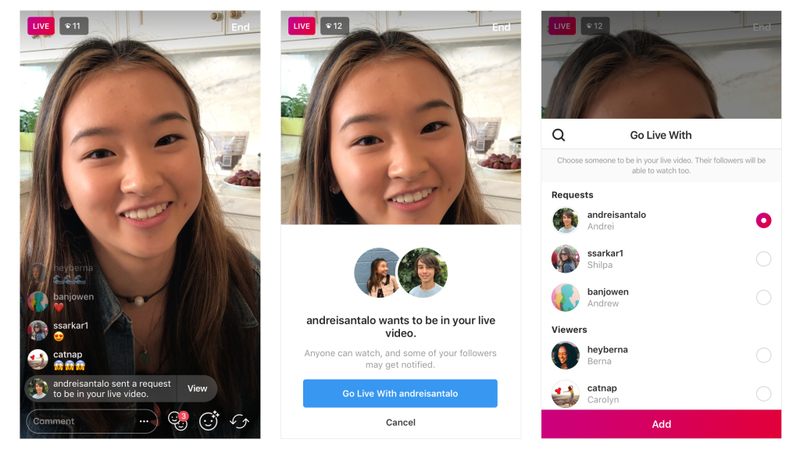 A brand new feature on Instagram allows you to ask to join any live video broadcast your friends are doing. Here’s how to use it. Going live on Instagram is very easy. And since last month, if you want to add a friend to join in on your live broadcast, you can do so easily as well. Now, Instagram allows the opposite as well. You can request to take part in a friend’s live video broadcast. It’s simple to do. While watching a friend’s live video, all you have to do is tap on the “Request” button that appears in the comments section. A confirmation will pop up when your friend approves your request, and you’ll have a short time to prepare to go live. Once live, the screen will split into two halves with you and your friend on either side. As the recipient of a request for live video, you will see requests from those who want to join in the comments section – each request appearing with its own notification. By tapping on the new icon with two smiley faces, you can also see the current viewers on your live video, as well as your requests. All you have to do is tap the “View” button and choose to add the friend who requested to be added, or cancel the request. There, you can also invite any viewer to join you, instead. As has been the case since you’ve been able to add friends to a live video, you can always remove any guest and add someone else at any time. Also, as was the case, you can share your live video to stories, or discard it. The new feature isn’t anything groundbreaking, but it really rounds off the group live feature launched last month. The latest feature is part of Instagram version 24 which is available for iOS and Android. You can now ask to take part in a friend’s live video on Instagram. Here’s how.